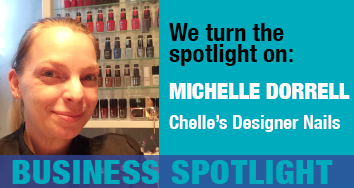 In this 10-minute episode, recorded during MicroBizMattersDay in London, Marianne is joined by Michelle Dorrell, founder of Chelle’s Designer Nails. Marianne Whitfield: … but she’s better known as the lady who asked the question on Question Time and gave the minister such a hard time. Michelle Dorrell: Yeah. So, I upset Amber Rudd I think a little bit. It wasn’t intentional at all. Marianne Whitfield: We’ve been spending all day here at MicroBizMattersDay at the Portobello House. You’ve been talking a lot, I think, today about your business and how you set up your business and how it’s going now. It’s great to hear that you’re actually now making a profit. Michelle Dorrell: Yes, so hopefully by the end of this financial year, I will definitely be putting in a plus figure rather than a minus figure on self-assessment. Marianne Whitfield: What I want to do today is really just talk generally about your experience of setting up your business and maybe think of any tips that you can give people who are really starting out on their initial journey. At Essential Business, we try and help people to make those first steps to identify whether self-employment and running their own business is right for them, so it would really be interesting to find out from yourself about how you found the whole experience and whether you think it’s a good thing that you’ve done and just talk to us about how it began. Michelle Dorrell: My situation was that I was unemployed, my first time in unemployment my adult life and it was trying to find a new step, a new ladder I could take, because at the time, we’re talking back in 2001 – 2011, sorry, actually, in the height of the recession, so it’s very difficult to find a job at that point, so I found an opportunity to go through an apprenticeship programme to retrain in a new career, which I took. I took that little leap and then I found within a few months that I was good at the new profession, obviously, doing nails. From there, with the practice sets that I was doing on my models, which were my friends and family, other people were seeing what I’d produced and then coming to me, as well, going, “Will you do our nails?” The whole idea of actually setting up my own business stemmed from there. Originally the whole point was hopefully, once I’d trained in the new career was to go and work for someone, but when it came about that my work, myself, was so good and I had such a vast following of clientele, let’s try and give it a go myself. Marianne Whitfield: Excellent. That’s great. What was the first thing that you did in order to take that step and set up on your own? Michelle Dorrell: First steps was it took me a few months of saving as much money as I could and to buy the products I needed, to buy the essential items just to have everything I needed for the beginning of the business. Obviously, going into the Job Centre was an empowering moment when I’m standing there saying, “I’m here to sign off of benefits.” Thankfully, it was only 18 months I was on them, but it was nice, like I say, very empowering to finally come away from them. From there it was just word of mouth for me. I was very lucky. What I did, so many people saw it, because I specialise in nail art, so when my clients went away, others would straight away go straight to their nails, because they’d stand out from the general ‘run of the mill’ sets of nails and how my business has just spread from there has always been word of mouth or recommendations. Marianne Whitfield: That’s great. That’s the best marketing there is, isn’t it? Marianne Whitfield: You’ve got free advertising with people wandering around with your products on their fingernails. That’s great. Michelle Dorrell: Yeah. There are occasions when I might have a couple of weeks where it’s quite quiet, so one of my little things that I do is I might do a special offer day where I’ll do the nails maybe for half the price than usual, because I’d rather have some cash flow coming in than no cash flow at all. That also helps in two ways, because I’ve got some money coming in, plus also more advertising, ie the person with the nails I’ve just done are walking then around out there with the nails fresh for everyone else to see. Marianne Whitfield: In terms of that experience, I know that your business has been going for what two and a half years now? Michelle Dorrell: Two and a half years now, that’s right. Marianne Whitfield: What do you think have been the highlights of those two and a half years? Michelle Dorrell: My biggest highlight was in December just gone, December 2015. I actually was able to make enough profit for me to finally pay myself. It was my first wage packet I’ve ever been able to take and it was an amazing feeling. I’d finally broken through that deficit and there’s now enough money in that kitty, not only to cover the everyday running costs of the business, but there’s now something extra so I can pay myself. That was lovely. Marianne Whitfield: How have you been surviving for the last two and a half years if you haven’t been taking money out of the business? Michelle Dorrell: …so I’ve just kept it going. Thankfully, Chelle’s Designer Nails most of the time, she’s been able to cover bits, but then there’s been other things that have come in where you have maybe a couple of months where you don’t get much customer in. That’s when I have to dip into my own personal finances to then pay the Chelle’s Designer Nails girls. Obviously, she’s – she, unfortunately I call my own salon a separate entity – the salon is only two and a half years old, so it’s still growing and it’s still becoming a fully-fledged business and it’s taken me a long time also to bring in new sets, because I’ve had to wait until I’ve had a stockpile of money available, then to go and buy a new product, to then go and expand into new areas. It’s only in the last six months, I’ve brought in CND Shellac products. I’ve just brought those into the salon now and that’s been a really big hit. I think that has also been my turning point, because it’s a new market, whereas before I just focused on acrylic extensions. Now I have acrylic extensions and the shellac products. Now I’ve got two sides to the business. Michelle Dorrell: Yes, it’s going wonderful. Marianne Whitfield: Where have you found all of your support as you’ve been running the business? Michelle Dorrell: My support has been basically friends and family. Unfortunately, when I went into the job centre and said, “I’m planning on becoming self-employed,” signing off of benefits, there was nowhere that they put me forward to. There was no other department that they could send me to for help and advice. Little things I found from the internet, but the internet can sometimes be confusing, because there’s so many different opinions and so many different options that I pretty much ‘winged’ my way through it, but I’m getting there. Marianne Whitfield: I saw that you were talking to Elaine Clark, who is from Cheap Accounting. Marianne Whitfield: What advice was she giving you? Michelle Dorrell: Advice that she’s given me is that I need to look up actually using a proper forecast accounting model, something along those lines. Sorry. I’m not very good with the maths and all that side. I’ve done it the old fashioned way with a log book to keep a record of all the purchases and another book with all the records of who’s- the sales. I’m a pen and paper person. I fail with the whole technological side, but hopefully, she’s going to be sending me a link to one of their models which they produced to start using for accountancy purposes. Marianne Whitfield: Obviously, very proud and very happy that you’re starting to pull in a profit with the business. What do you think the next step is going to be? Michelle Dorrell: Next step for me is just continuing to grow the business, expand into new areas. There’s many different types of nails that could be done. When you say false nails, there’s different formulas. You have acrylic, you’ve got gel, you’ve got fiberglass nails. It’s just making sure I have every market of every brand, really available, because everyone’s different. One person might want shellac. Another person might want gel nails. It’s just making sure that you’ve got the ability to offer everything. Marianne Whitfield: What would you say to anybody who’s thinking of going out on their own? Michelle Dorrell: My first bit of advice to anyone thinking of starting their own business is have a look around your area, have a look. See who else is in the same sort of business as you, what they do. See if there’s a little niche that you can find in the market that’s not really explored and then if you can get into that, that’s probably your biggest bonus to get you in there. If it’s something that no one else covers, you’re the person for it. With me, I found nail art was my success story, because not many people did the art projects, whereas that’s my favourite bit. Michelle Dorrell: None at all. Marianne Whitfield: None at all? Michelle Dorrell: None at all, other than maybe crying and looking like a guppy fish woman on Question Time at the end. Marianne Whitfield: Well, that’s another source of free marketing for you. Michelle Dorrell: I don’t think I looked very good that day. Marianne Whitfield: Michelle, thank you very much for talking to me and best of luck with your business going forward.